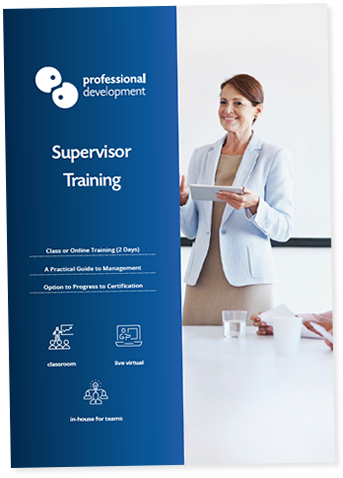 You will gain practical and relevant skills needed by any supervisor during our Supervisor Training Courses. We teach you how to work with different personality types, communicate effectively and handle difficult situations professionally. Our Supervisor Training is available as an in-company course which can be held in any location throughout Ireland. By choosing in-company training, you are giving your business the flexiblity to run the programme at a date and venue that works best for you. It also means that the course content can be customised to address challenges and goals specific to the supervisors in your organisation. If you would prefer to attend a public training course, we run Supervisor Training as part of our management skills course throughout the year. This 2-day course takes place in our Dublin training venues. Use the buttons below to find out more about our Supervisor Training. You can get full course details, ask a quick question, or visit our in-company training page.